Rosemary is a popular indoor herb plant used for culinary purposes and to enhance the décor for the holiday season. Thanks to their upright growth and needle-like foliage, these fragrant herbs make perfect miniature Christmas trees, but how can you help your plant keep its shape and be a beautiful home accent all year round? Rosemary herb plants are easy to find during the holiday season, and are the ideal size for trimming into tree shapes. We carry the healthiest selection of rosemary bushes, including varieties of rosemary that can be difficult to find elsewhere. Another option is growing your own rosemary from a smaller plant, starting several months before you want to decorate the miniature tree – making this an ideal spring or summer project too. 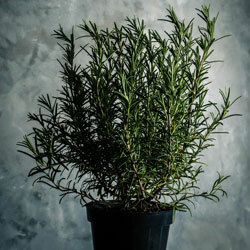 Choose a proper pot, ensuring it has plenty of drainage, and use nutritious potting soil to nurture the young rosemary. Provide it with proper lighting and good air circulation to minimize the risk of powdery mildew or other problems, and water it appropriately for lush growth. A small stake may be necessary to encourage straight, upright growth to ensure a tree-like shape, and regular pruning will be needed to coax the plant into a preferred form. Pruning rosemary into a tree form is no more difficult than clipping fresh herbs for use, but you do need to have the proper tools for clean, safe cuts. A small pair of pruning shears or set of floral clippers is ideal. Clean them between each pruning so there are no bacteria or fungus that can be transferred around the plant, and it may be wise to reserve the pair only for your rosemary bush for extra protection, especially if you plan to give the shaped plant as a gift or use it as a holiday centerpiece. To achieve the cone-like shape typical of a Christmas tree, leave the base of your rosemary plant full and bushy, while gradually tapering toward the top of the plant to create the pyramidal structure. If you’ve started with a smaller plant, it will be necessary to let several larger branches grow, then choose the strongest, most upright specimen to be the “trunk” of your rosemary bush. Trim all the other sprigs away, allowing that central section to thicken and grow so it can support the bush’s shape. Over time, additional branches will grow – trim the very bottom sprigs away several times before allowing them to reach out and form the bottom of the tree shape. More frequent pruning will encourage a fuller, thicker shape, while pruning less often will give your bush a more open structure. Both styles can become lovely decorations, but bear in mind the types of decorations you want to add to your rosemary tree so you can prune and train it accordingly. Rosemary bushes look lovely as holiday decorations if they are simply shaped and accented with a festive foil cover or bow on the pot. Canvas or decorated cloth covers with ribbons are other easy options, but many people want to jazz up their plants even more. Adding a miniature string of light-weight fairy lights, a few tiny ornaments or even a small strand of beads are easy ways to give your rosemary bush extra holiday flair, but you don’t have to confine your decorating excitement to just the Christmas season. Why not cut out felt triangles to create a jack-o-lantern face on the bush for Halloween, or stick pheasant feathers or mini pinecones into the pot to give it a harvest look for Thanksgiving? Red, white, and blue ribbons or streamers are a great Fourth of July option, and festive plant picks are available for any holiday. You can even create a small fairy hut or miniature scene in the pot with your rosemary to give it a whimsical touch all year long. Rosemary trees may be most closely associated with the holiday season, but you can make every day a holiday when you trim your own rosemary and decorate it for any special day you wish.